The Main Injector Neutrino Oscillation Search experiment is a long-baseline neutrino experiment designed to observe the phenomena of neutrino oscillations. MINOS uses two detectors, one located at the source of the neutrinos at Fermilab and the other located 450 miles away in northern Minnesota at the Soudan Mine. 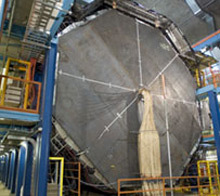 Beginning in February, 2005, researchers began directing neutrinos in the NuMI, Neutrinos at the Main Injector, beam straight through the earth from Fermilab to Soudan – no tunnel required. Because neutrinos travel at the speed of light, physicists need to place their detectors far away to give the neutrinos time to oscillate. In Minnesota, a 6,000-ton steel detector searches for neutrinos that have changed types, or flavors, during the split-second trip. More than a trillion man-made neutrinos pass through the MINOS detector each year, but because neutrinos interact so rarely, only about 1,500 of them collide with the atoms inside the detector. The rest pass through with no effect. The MINOS collaboration members are studying this change, called neutrino oscillation, to see whether it can answer questions about the abundance of matter in the universe or lead the way to new physics. They investigate neutrino oscillation in three ways. First, they measure the rate at which muon neutrinos disappear into other types. Second, they measure whether those other types of neutrinos are of the known neutrinos. Third, they search for the appearance of electron neutrinos from muon neutrinos. This oscillation is the best and perhaps only way to measure CP-violating effects with neutrinos. The MINOS experiment includes more than 200 scientists, engineers, technical specialists and students from 32 institutions in six countries. Fermilab hosts the project under contract to the United States Department of Energy and by the Soudan Underground Laboratory, operated by the University of Minnesota in cooperation with the Minnesota Department of Natural Resources.